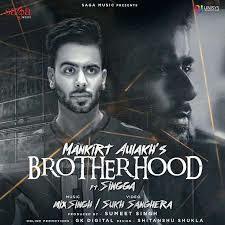 Presented New Punjabi Songs 2018 BROTHERHOOD in the sensational voice of MANKIRT AULAKH ft. SINGGA that a amazing heart touching songs for your share with your best friend. mankirat aulakh brotherhood song lyrics based on best friend and how a man live life without best friend. if you enjoy mankirat aulakh brotherhood lyrics then tell us in comment and if you feel some mistake in this song so tell us without any doubt in comment section. here enjoy another latest song lyrics.